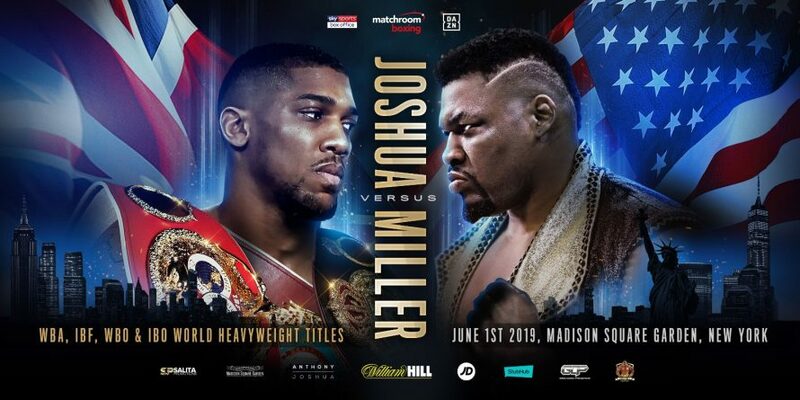 NEW YORK, Feb. 13, 2019 – Heavyweight boxing’s biggest star Anthony Joshua OBE will defend his WBA Super, IBF, WBO and IBO World titles against Jarrell Miller in his long-awaited U.S. debut at the iconic Madison Square Garden in New York on Saturday, June 1, live on DAZN in the U.S. and Sky Sports Box Office in the UK. “Anthony Joshua is the number one Heavyweight in the World and DAZN is excited to deliver the British star’s much-anticipated U.S. debut at the iconic Madison Square Garden,” said Joseph Markowski, DAZN Executive Vice President, North America. “In New York awaits a hometown fighter in Jarrell ‘Big Baby’ Miller who has been quite vocal about his plans to spoil Joshua’s stateside arrival. He poses a real threat to dethrone the Heavyweight king in what will undoubtedly be a major international attraction and we are eager to see what will unfold June 1 on DAZN. “A new chapter for our brilliant World King Anthony Joshua as he looks to light up America for the first time against New York’s brash, big hitting Jarrell Miller,” said Adam Smith, Head of Sky Sports Boxing. “We are delighted to be showing this massive occasion on Sky Sports Box Office and our team will provide every step of an enticing build up between these unbeaten Heavyweights. This sizzling Summer showdown reminds me of when Prince Naseem Hamed conquered Manhattan amidst that thrilling seven knockdown war with Kevin Kelley. Now AJ hits NY and the global adventure begins!